Resplendent with historically and architecturally important buildings, Chamba town in its temples and palaces preserves much of its rich medieval past. Perched on a plateau overhanging the river Ravi, the town is named after Champavati, a daughter of Raja Sahil Varma of the Bharmaur royal house who shifted his capital here in 920 AD. Isolated by high mountains in its beautiful valley, Chamba over the centuries was allowed to develop its own style of ‘Pahari’ art and architecture. Much of this heritage has been preserved and Chamba, known for the splendour of its temples and handicrafts, is replete with artistic masterpieces. Other evidence of Chamba’s heritage can be seen in the famous collection of miniature paintings from the Kangra, Basholi and Chamba schools at the Bhuri Singh Museum, as well in the murals and other artefacts at the RangMahalPalace. Chaugan, the grassy meadow at the heart of the town, is also the centre of its cultural activities. In July/August, each year, the Minjar fair is held here. Valley Gods and Goddess in their majestic palanquins are brought down from the mountains to pay homage to Lord Raghuvira, the presiding deity of the valley. During the week long harvest fair, the ground comes alive as villagers in colourful dresses celebrate with sport, song, dance and music. The Hari Rai temple near the Chaugan (dating back to the 11th century) known for the four armed bronze statue of Lord Vishnu (Chaturmurthi) is a masterpiece in metal craft. Overlooking the town a little distance away, the temple of goddess Chamunda Devi has some of the finest wood carvings adorn its exterior and interiors. Chamba is 122 Kms from Pathankot – the nearest railed, 378 Kms from Shimla and 56 Kms from Dalhousie. 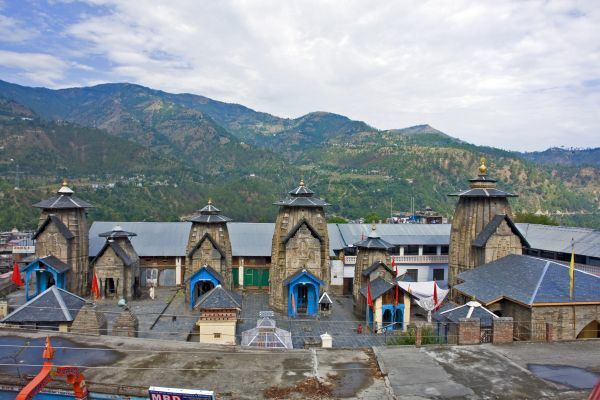 Katasan Devi Temple: A popular place of pilgrimage (30 Kms) with the temple premises being an excellent vantage point for a view of Chamba valley. Sarol: Landscaped gardens, a sheep breeding center and an apiary make Sarol (11 Kms) an interesting place for picnics. Jhamwar: In the vicinity of thick alpine forestlands, Jhamwar (10 Kms) is famous for its apple orchards. Saho: Perched on a scenic plateau along the bank of river Sal, Saho (20 Kms) is famous for the Lord Shiva temple –Chandrashekar, with has the moon for a crown. Salooni (56 Kms, 1829 m), has some of the most awesome views of the Greater Himalaya snow ranges. Bhandal valley: The beautiful valley of Bhandal (1831 m, 22 Kms from Salooni), is rich in Himalayan flora and fauna, and makes for an ideal retreat. Pangi valley: Over the Sach pass (4428 m), 137 kilometers from Chamba, full of grandeur and tribal majesty is the land locked valley of Pangi. The native Pangwals and Bhotis are robust hardworking handsome people who keep the valleys unique culture alive in folk songs, music and tribal dances. Beyond the reach of tropical monsoon rains, the valley is one of the last off beat challenging tourism destinations in the state. From Killar, the sub-divisional headquarter of the valley; there are a number of exciting treks to Keylong, Mandi and Kishtwar in Kashmir. Climate: The temperatures at Chamba moderates between 36ºC in summer and 0ºC in winter. Woollens for winters and cotton clothing for summer are required. Getting there: Well linked roads provide ample public and private transport for Chamba. Nearest airport is 180 Km away at Kangra. Chamba is 122 Km from Pathankot (the nearest railed), 378 Km from Shimla and 56 Km from Dalhousie. There are opportunities for a number of interesting treks from Chamba. The Pangi Valley and the Manimahesh range offer exciting possibilities. A branch of the Mountaineering Institute, Manali, at Bharmaur organises treks and provides basic equipment’s like tents, sleeping bags etc. Chamba to Killar in the Pangi valley over the Sach Pass and onwards to Kishtwar in Jammu and Kashmir. Chamba to Manali via Udaipur in Lahaul Valley; Bharmaur to Trilokinath/Udaipur in Lahaul over the Kalicho Pass (4803 m); to Udaipur over the Chobia Pass (4966 m); to Manali over the Kugti Pass (5040 m); to Manimahesh (4170 m). Chamba is also the base for delightful one or two day treks to places like Khajjiar, Jhamwar and Kandi-Bassu. Water Sports: The Ravi and its innumerable tributaries meandering through picturesque gorges and valleys, foaming over rocks and boulders offer excellent opportunities for white water rafting, canoeing, and kayaking. The river also provides marvelous opportunities for anglers.